Another member of the original USS Enterprise crew has passed away. 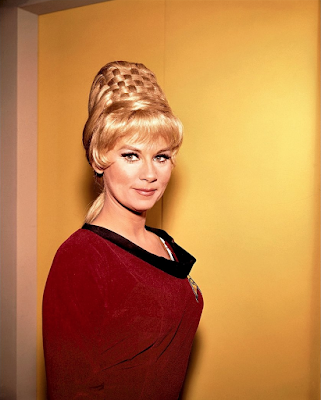 Grace Lee Whitney, who played Yeoman Janice Rand on the original Star Trek series, died of natural causes on May 1 at age 85. Born in Ann Arbor, Michigan, Whitney first garnered attention in her teens as a singer on Detroit radio. After a few years, she began appearing onstage, opening in nightclubs and on Broadway, and shortly thereafter on film and television. From the early '50s through to the '70s, she landed guest roles on shows like Wagon Train, Gunsmoke, Bewitched, Batman, and The Outer Limits. Billy Wilder featured her in Some Like it Hot and Irma la Douce. It was her limited run on Star Trek, however, in 1966, by which fans tend to remember her. For eight episodes of the original series' first season, Whitney appeared as Yeoman Janice Rand, an assistant to Captain Kirk. While much of her role consisted of handing pre-iPad computer briefings to the captain, episodes like "The Enemy Within" and "Charlie X" folded her in as part of the main action. Despite this, she was summarily released from her contract after the first half of the season. Whitney's relationship with Star Trek was initially tumultuous. Trek was always staring down budget constraints, and in an interview with The Sun Whitney stated she felt her contract was released for two reasons: one, that her evolving and increasingly romantic relationship with Captain Kirk was limiting and two, because the bridge was getting a little crowded. "They wanted Captain Kirk to have romances in each episode with a different person," she said, referring to the show's producers. She claimed to have been written out of the show because they believed audiences didn't want to see a settled-down captain. Additionally, Majel Barrett, who would later become Majel Barrett-Roddenberry, was cast as Nurse Christine Chapel, and as Whitney put it, "One of the blondes had to go." Whitney also alleged she was sexually assaulted during this time by an executive at Desilu, the production company responsible for Star Trek. She refused to name him in her biography, claiming that it was "her story, not his." After Trek, Whitney struggled with alcoholism and drug addiction, a recovery from which shaped the bulk of her post-Trek work. Her family has stated that she would prefer to be remembered as a "successful survivor of addiction." Whitney credited late castmate Leonard Nimoy as her sole advocate during her most difficult times and the one who brought her back into the Trek fold for minor roles in some of the original cast's Star Trek films. She also reprised her role as Rand in a guest appearance on Star Trek: Voyager and in a few fan films. Mary Ann Chase was named Grace Lee Whitney by her adoptive family, and if names have meaning, there is some to be found in hers. Whitney turned her struggle with substance abuse into something positive, working locally as an advocate for others after 35 years of sobriety. Though she was part of one of the biggest cultural phenomenons of our time, her family says it is her work with drug addiction she would want as her legacy. Still... we are a geek website. Think Star Trek would have been different had she remained on the show? Share your thoughts about her life, or leave condolences, in the comments below.